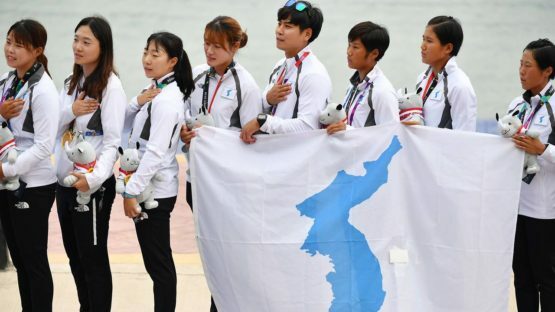 Athletes from North and South Korea combined to win an Asian Games gold medal for the first time in their history with victory in the women’s 500 metres dragon boating on Sunday. It was the first gold at a major Games for a Unified Korea team, and came nearly three decades after their last title together — in the women’s team event at the 1991 world table tennis championships. North and South Korea have also joined forces in rowing and women’s basketball at the regional Olympics following a rapid improvement in relations this year. At last week’s opening ceremony, the Korean teams marched together behind the Unified Korea flag, held aloft jointly by South Korean women’s basketball player Lim Yung-hui and North Korean footballer Ju Kyong Chol. They also competed together in women’s ice hockey at the Pyeongchang Winter Olympics in February, an event that ushered in a series of reconciliatory moves.